76-year-old actor who endorsed Netanyahu seen touring Jerusalem. 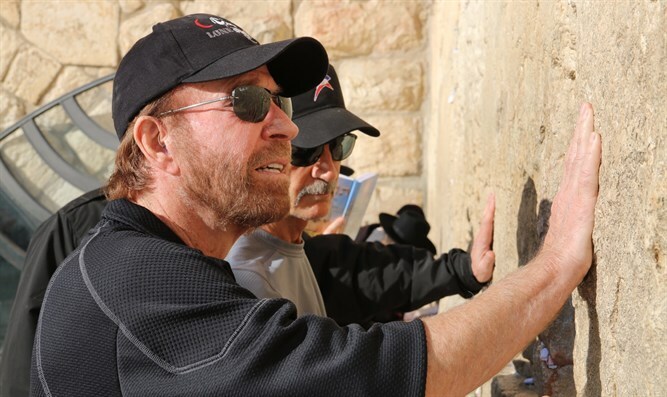 Hollywood star Chuck Norris quietly arrived in Israel over the weekend, and on Sunday was seen visiting Jerusalem. The reason for Norris’s visit is not clear, but his tour of the Israeli capital included a visit to the Western Wall Tunnel, the underground tunnel exposing the full length of the Western Wall. He was also seen at the Kotel itself. Israeli media also noted that Norris also met Dore Gold, formerly the Director-General of the Israeli Foreign Ministry. Gold tweeted a photo of himself and Norris at a restaurant near Tel Aviv. Norris endorsed Prime Minister Binyamin Netanyahu before the 2013 elections and again before the 2015 elections.